Anything at all as long as it goes with my shoes. 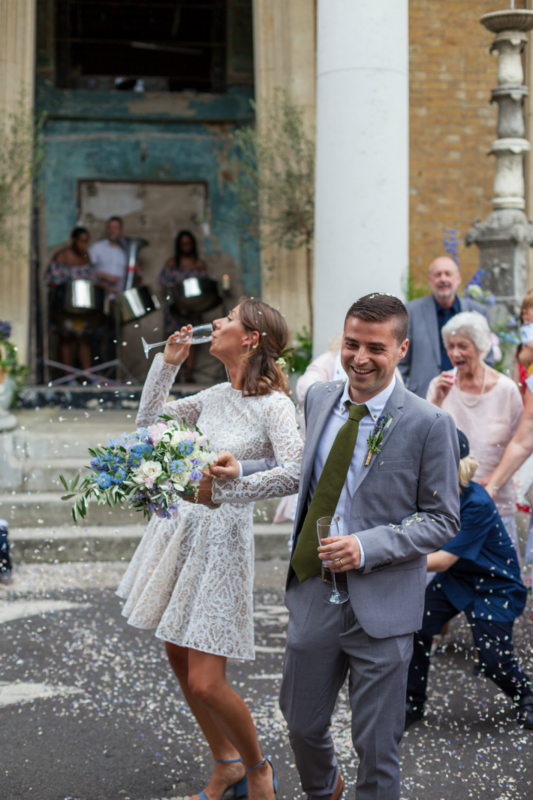 In fact, how can you not be the coolest bride when you own an entire olive grove in Greece and yet you arrange to marry the love of your life in the coolest place in the borough of Southwark, South London. 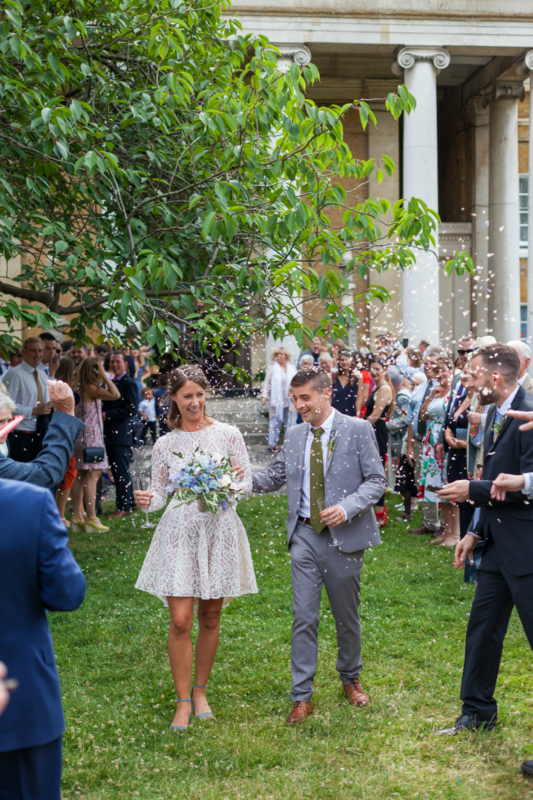 She wanted to have an informal and relaxed wedding where people felt comfortable, did not have far to travel and, most importantly of all, had fun. After all, SE15 is where both Alan and I each bought our first flats. 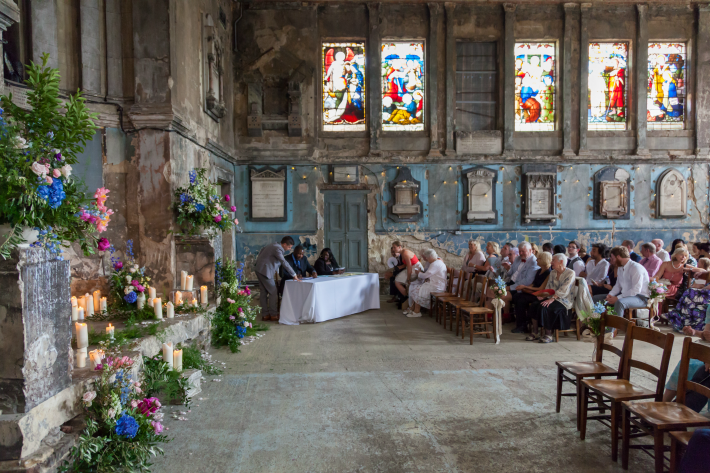 This gritty, vibrant, varied and culturally mixed London district is the place we know so well. Well before the sun was up, we would drive through it’s (virtually) silent streets on our way to the flower market. On rare days off as we would relax on the glorious Rye and on many a night we would sit in one of it’s local pubs (the Only Fools and Horses kind we hasten to add) and discuss all of our dreams (and nightmares!) as we found our place within the wonderful world of floral design. 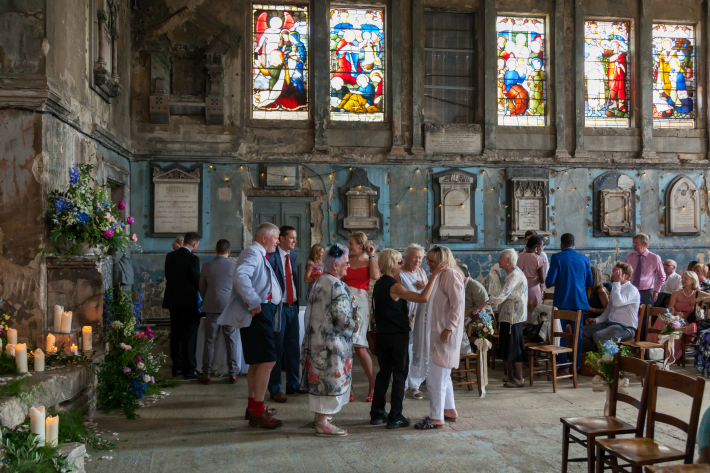 For Alan and I, for Kate and George, and for thousands of other people ‘in the know’, Peckham is in all likelihood THE coolest place on earth. 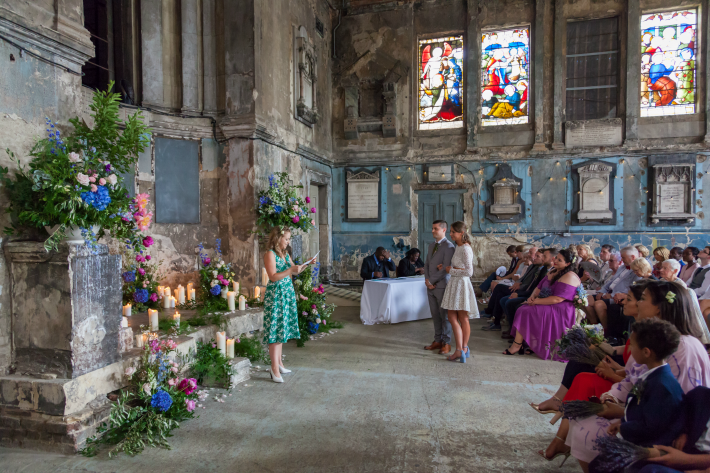 Kate and George decided to hold their ceremony at the stunning Asylum, Caroline Gardens Chapel because they had grown up in South East London and had heard good things about the chapel from their friends. Asylum was also ideal because it was within walking distance of their reception venue; The Ivy House, London’s first co-operatively owned pub. In the end, in keeping with their care-free, cheerful and cool-as-cats ceremony, Kate and George decided to keep their guests company in between locations as they all caught the good old P12 bus! When it came to designing the overall look and feel of the wedding, Kate didn’t want to be too prescriptive. 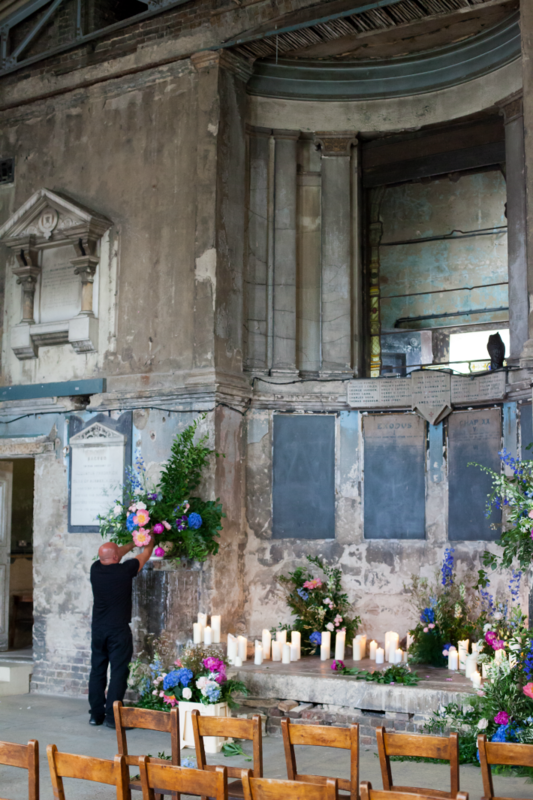 Instead, we were simply asked to work with the stunning interior of the chapel, to channel that beautiful blue shoe colour and to give a nod to their Greek olive grove. 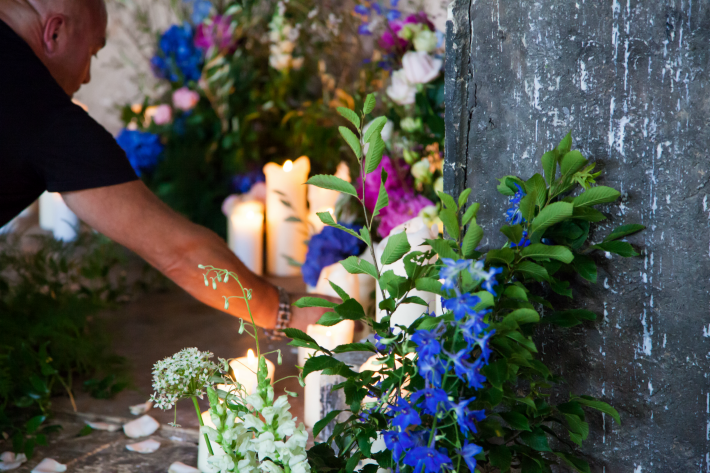 This proved to be an inspirational brief – especially when we were allowed to run riot with the glorious array of flowers available in the month of July. 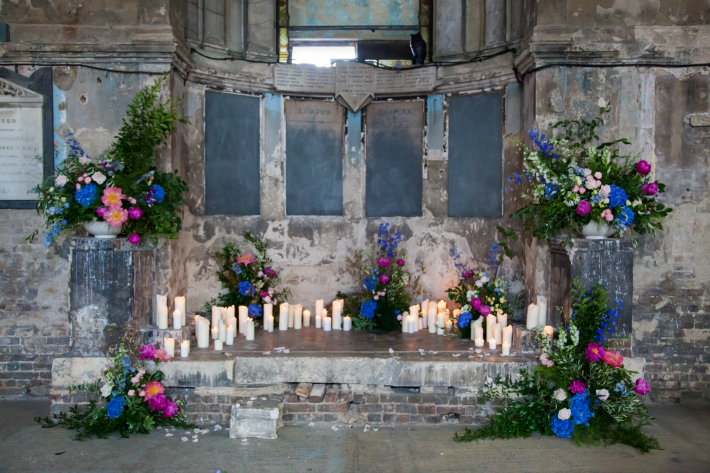 A combination of delphinium, sweet peas, peonies, hydrangeas and plenty of candles were just begging to be used. 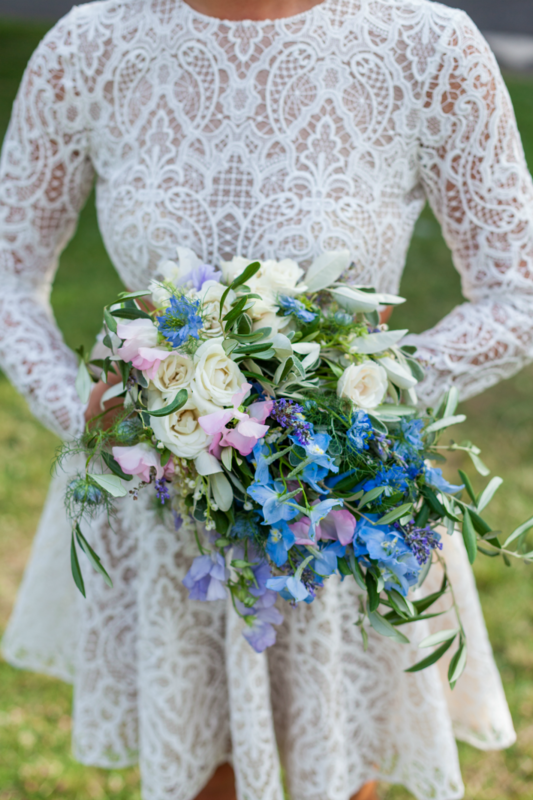 For Kate’s bouquet, a loose style of roses, olive foliage, sweet peas, delphinium, nigella and lavender were combined to compliment her French designed Rime Arodaky dress. This stunningly cute, short dress was the perfect choice for her wedding day. As I didn’t want a long dress it was incredibly hard to find anything in this country. When I saw this designer and found their ‘Civil Collection’ I was blown away, I had to buy it online…. a bit of a gamble but I was so glad when it arrived… it just about fitted after a couple of extra classes in the gym! I looked everywhere from Jimmy Choo to New Look but didn’t feel the glittery glamorous typical bridal heels were very ‘me’. The end result was a stunning bride, a beautiful venue and a wonderful day that the happy couple was able to share with their family and friends. So what is the secret to being a cool, calm and collected bride? We decided to just come out and ask her. 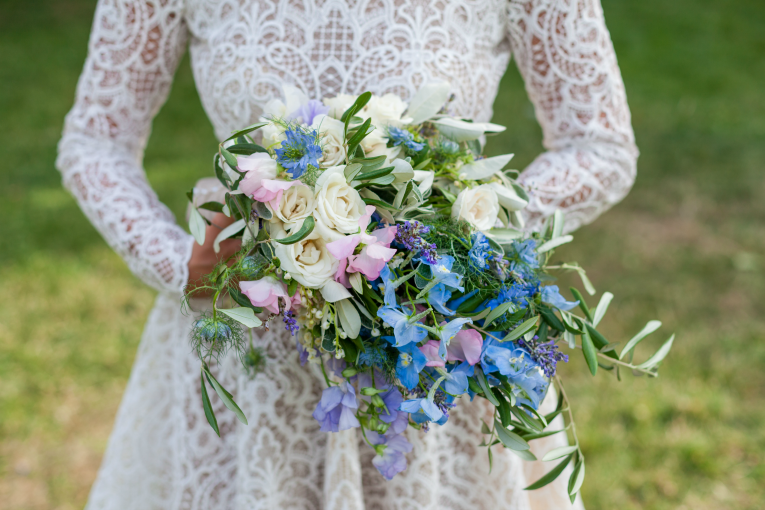 Would you consider yourself a relaxed bride? Not beforehand! However the day passed by seamlessly and I was able to spend quality time with friends and family even though I was nervous leading up to it. What would you advise other brides about keeping your cool? Don’t get swept away in it all, it is one day and you get immense pressure from family members and friends for it to be ‘perfect’ but just stay calm, don’t let it take over. I wish I had asked for more help from people and never feel shy to ask brides that have recently done it. I am already helping two close friends who are planning their weddings for next year. 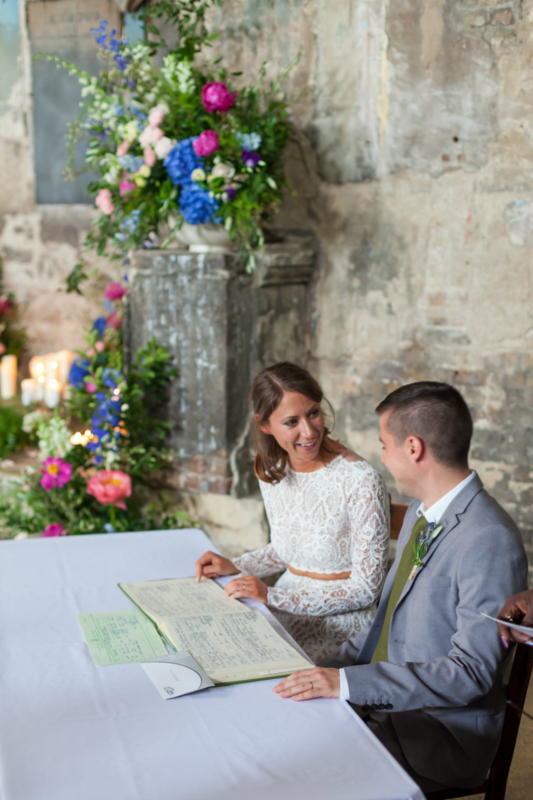 If you don’t know anyone that is recently married ask a friend of a friend as it’s really helpful to speak to someone who has just done it. 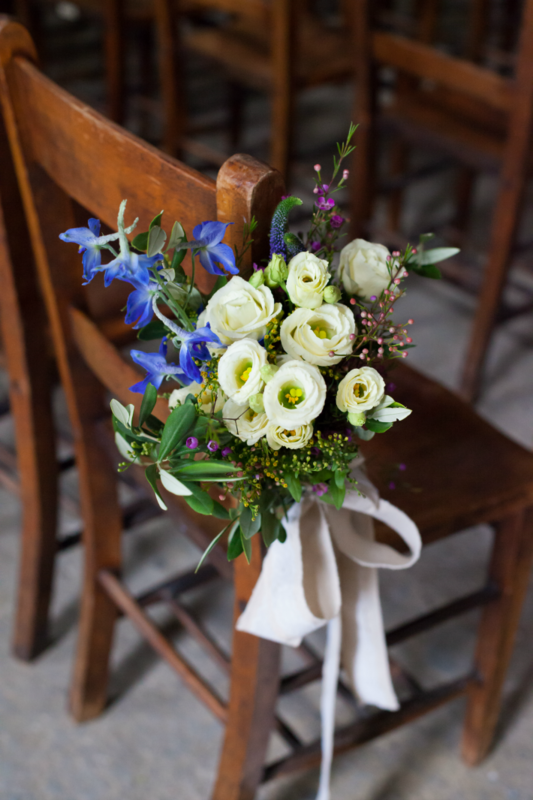 If you were offering any advice to a bride when planning wedding flowers what would it be? 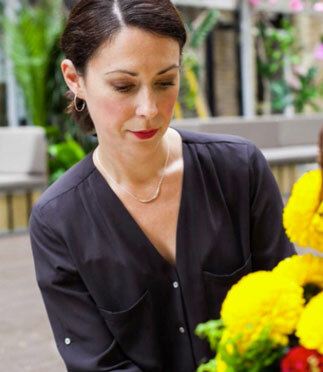 Make sure you feel comfortable with your florist. Planning wedding flowers wasn’t our strongest point. You were able to identify what we wanted by talking to us and understanding our likes and dislikes. This was done in a couple of informal meetings a few months beforehand, which made it really easy. Being able to speak with people so knowledgeable inspired us in to choosing what we wanted. What stands out for you when you look back on the day? I am not just saying this because it’s your company, I think the flowers were the best bit! 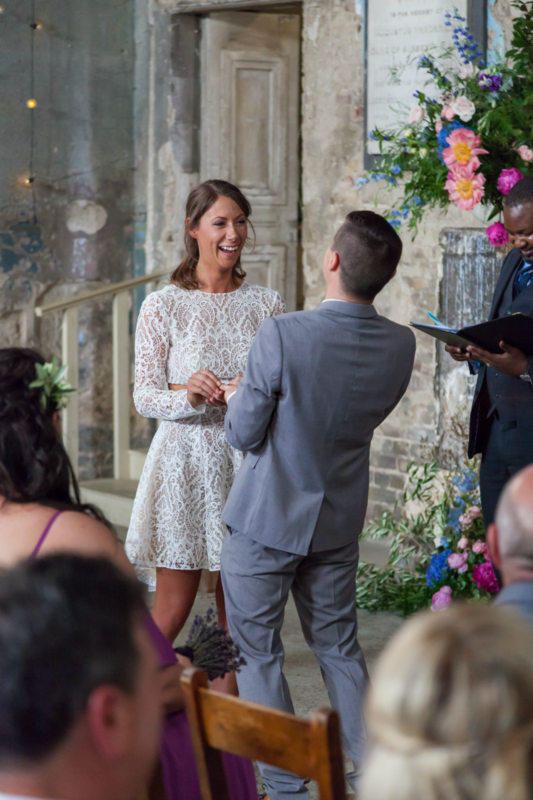 When I got to the chapel and saw them light up the room, it really blew me away. Everyone I see is still commenting on how incredible they were.